Northern cyclists are used to three things: rain, cold and mud. Even in a heatwave we won’t leave the house without some long sleeves in our pockets just in case, and our mountain bikes have tractor tyres on them all year round because we believe “dry conditions” is a myth. Some vile blizzard is always just around the corner, but we ride anyway and this is why we bask in the certainty that we are the hardest athletes in the world. 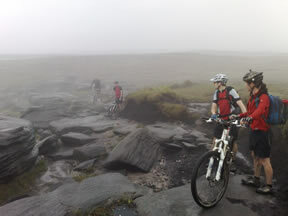 This year we decided to do our first (and hopefully not only) 2010 mountain bike weekender in the month of June so as to maximise available daylight and avoid any potentially inclement weather – and after a week of scorching days and a forecast of more to come, this was set to be a rare experience. Assembled at the usual start point in sunglasses and factor-30 was a crew of Clarion regulars: Dave, Paul, Graham and me (Oliver). We were wondering if, having devised the route, Mark would actually manage to ride it because rumour had it he was ill. But then he appeared, dosed up on antibiotics – no doubt against the better judgement of his accompanying doctor (and also wife) Maggie. The six of us headed north on familiar trails through Wednesday night-ride territory, except this time we were in blazing sunshine so it almost felt exotic. We met Emmy somewhere in the vicinity of our regular haunt Haughton Green then set our sights for the lovely garden of the Diggle Hotel, where we could eat our lunch under a shady tree before some extreme climbing up into the Pennines. Graham went the sensible way, following the canals because he was still recovering from illness and didn’t want to sweat himself to death up on the moors. The rest of us went a little more extreme, taking in some high-altitude reservoirs and some absolutely crazy singletrack over Saddleworth Moor. First mechanical crisis of the ride this year was down to me. There’s Karma popping up again: it bit me last year for being smug when everyone else’s bikes broke and mine didn’t (so then I crashed it and bent it using my own ribcage). Similarly this year I was punished by fate by having spent so long fettling and polishing my bike before the ride then telling everyone there was nothing that could possibly go wrong. As a result, my headset started making a cracking and popping noise on the big singletrack downhill, which sounded like my frame splitting open. Despite my worst fears and a brief trailside workshop session, however, it did end up lasting out the ride without catastrophic failure. Shortly after that it was Mark’s turn, this time with a slash in the side of his tyre leaving it about a nanometre from a blowout. Miraculously it lasted till he’d managed to buy a replacement, probably thanks to the gaffer tape that Paul had in his magic bag. Not the sort of thing you’d think to take out on a ride, but just goes to show the value of preparation. Since neither of these mechanical setbacks was too calamitous, we made it to Diggle with plenty of time to laze in the sunshine for a while and eat a hefty lunch with bonus chips. By this point it was absolutely sweltering, and the pain of having to leave the shade of the big tree after lunch was compounded by a gruelling climb right up to some of the higher points of the Pennine Bridleway. This was the root of a slight disagreement: Mark had promised only one big climb on this part of the ride, but Graham was of the opinion that there were in fact three. Mark then conceded that the one big climb was “split into three”. Either way, it was a beast. The only thing that kept us going was the knowledge that the stifling air on the way up the mountains would be replaced by a refreshing breeze once we reached the exposed tops. Along the tops the undulating path felt like a purpose-built trail centre, and only as far north as where the M62 bisects the moors the landscape already felt very different to the Peaks further south where we usually ride. The almost featureless, Jurassic country was blackened with a soft peaty soil that was rubbery to ride over in the dry, and a welcome change from the grinding grit that destroys our gears back home. All that could be heard and seen in all directions through the haze of the hot day was a gentle breeze over low heather and wild grass. Apart from a brief drop down to Littleborough for ice creams beside Hollingworth Lake, we maintained our high altitude for miles until the last fiendish downhill along a pack-horse trail down to the hostel at Mankinholes. It was pointed out that if this was anything like last year then that last downhill would be the point at which I start showing off and then crash. True to form, that’s exactly what happened. Unlike last year’s, after which I couldn’t move my right arm properly for about six weeks, this one was a relatively pathetic affair, but the result (and the photo) was very similar. Both crashes ended up with me in the foetal position for the cameras, plus lots of bruises and scrapes. Also on both occasions I would blame them on the same cause: that’s what happens when an extreme rider pushes the boundaries of what is possible on a bike. Or more likely, when he forgets how to ride over a slight bump in a straight line. Thankfully, minutes later we arrived at the Mankinholes YHA hostel, cleaned up and went straight to relax in the evening sun outside the Top Brink pub. This place is clearly used to having cyclists in looking for thousands of calories: top of the list on its side orders menu was extra Cumberland sausage. We ate until nobody could even speak, then off to bed. There is a volcano on the Hawaiian island of Maui which, with its barren reddish-black earth, jagged rock formations and sparse other-worldly flora, was used as the location for the planet Mars in the film Total Recall. TriStar Pictures obviously didn’t realise they could have saved a few dollars by making the film just outside Rochdale, because the first Pennine ridge we travelled along on day two was almost exactly the same. The dramatic scene was probably enhanced by the return of more familiar conditions: rain and mist. Sun lotion and dark lenses had been replaced by Gore-Tex, but even though the sunshine had gone the riding was spectacular. Being saturated within the first mile is nothing new, and as long as we kept moving the temperature was perfect. This time the only thing that could be seen and heard through the mist was Emmy grinding her XTR chainrings on rocks. For those who are less familiar with mountain bike technology, XTR is the ultra-light, pro-racer only equipment that is made of gossamer and fairy wings and costs more than some cars. Trails like this aren’t good for it, but then if we’d wanted a cheap sport we’d be playing badminton. Having clattered and scraped our way through a spectacular rock garden, we eventually joined a pack-horse trail coming down off a high moor and into Marsden. Thankfully it was still raining, because otherwise that descent would have cooked our brakes. 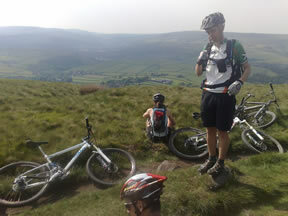 Next destination was the highest point we could find before a reverse of yesterday’s monster climb out of Diggle. We were all grateful to Mark for plotting the route to follow a direct tarmac climb so we could regain our altitude with minimum effort. We spun up the hill while sharing out jelly sweets mixed with grit, and then began a completely exhilarating, seemingly never-ending downhill. Arriving for our lunch, soaked in mud, we were met in the doorway of the Diggle Hotel by the proprietor who was keen to direct us to his outdoor seating. A quick wash, change of clothes and huge Sunday lunch later, and nobody was in any mood for any more action. 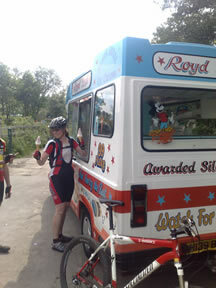 Fortunately the canal towpath took us all the way home via an uneventful, but ever so slightly downhill, direct route through Stalybridge and Hyde – a perfect warm down after another memorable big ride. Thanks as ever to Mark and Maggie for planning the trip, plotting the route and taking all our stuff to Mankinholes. Thanks also to Graham for taking the van with all our gear home again from the wilds of the Pennines, and thanks to all for joining in and making a great weekend of it.